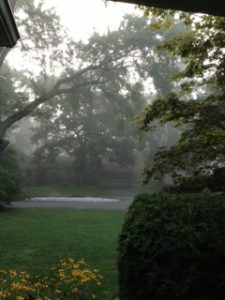 I have always loved the fog, especially after bright hot August days in Maine when it rolled in from the Atlantic and the horn at Seguin began its plaintiff chant. Fog has often been a welcome presence for me, soothing the bright edges of life that cut so sharply. These days, I like to watch fog roll across Lake Michigan, or sit by the Betsie River as the mists dissolve. Even here at home, foggy mornings soothe my spirit. “But where was the fog? The winter days remained relentlessly bright and sunny. Clare and Bess at the loom, the Fisher folk by their boats, the Marshlanders in their huts and the little spinners in the weaving house all prayed long and hard for the Gray Mother to come to their succor. But January wore on, and no help came.